Owning and riding a motorcycle is quite a financial investment. It’s also a risk. Bikes cost money to maintain. If an accident happens, it will cost money to repair. It’s also going to cost money to insure. Everyone wants to pay affordable rates for their motorcycle insurance. Nevertheless, a lot of different factors might impact how much you pay for your coverage. Among them might be your credit score. Though you might not realize it, your credit might drive up your insurance rates. A low credit score often signals a problem for your insurer. Don’t let your policy costs become a problem because of bad credit. Your credit information represents your ability to pay those to whom you owe money. These are your creditors. Creditors might include banks, credit card companies, mortgage companies and more. When you take out credit, you might accumulate debt as you begin to spend the funds provided by lenders. Debt itself is not uncommon. Most people have a little here and there. However, mounting debt poses a problem to everyone. As your debt increases, you might have a problem repaying it. Creditors stand to suffer because they don’t receive a return on the money they pay on your behalf. If your financial credibility crops, so will your credit rating. This is a three-digit number that serves as a measure of how reliable you are to repay debt to creditors. But, how does this impact motorcycle insurance rates, you ask? When insurers issue policies, they take a look at what the policyholder will be like as a customer. Usually, they reward the most reliable customers with more favorable rates. This is because those customers usually have a low financial risk for the company. Among the factors insurers might look at is your credit score. Policy prices often center on the concept of how much risk a client poses the insurer. In other words, how likely is this customer to file a claim? How likely are they to pay their policy premiums on time? If you don't pay your policy bill on time, the insurance company stands to lose out. Also, if you don't have a lot of money on hand to pay for bike damage, you might have a higher likelihood of filing a claim. This also represents a cost risk to your insurer. Usually, lower credit scores mean you have a higher risk of having to take these actions. Greater risk usually equals higher prices from the insurer. Therefore, lower credit scores might drive up the prices of your policy. 1. Don’t open multiple lines of credit. Everyone probably has more than one credit card, and generally, that’s fine. However, if you frequently open new credit, this might signal a problem for your insurer. They might think you are desperate for new credit because you have low reserves. 2. Keep credit balances stable. Many people think they can free up more credit by moving money from credit account to credit account. Again, this might signal to your creditors that you are looking for ways to improve your credit. 3. Monitor your credit spending. Credit is not your only source of income. Generally, the more hard cash you spend on everyday costs, the lower your chances of going into debt. Therefore, you should strive not to pay for everything you buy using credit. 4. Avoid debt. The best way to improve your credit is to keep your debt under control. You should strive to pay all your bills on time, and in-full. While there’s little wrong with keeping balances on credit accounts, it’s often a good idea to pay off more than you add to it. This will help keep balances low. Of course, paying credit card bills in-full is always the best practice. 5. Don’t miss payments. Failing to pay bills, even by accident, might cause fluctuations in your credit score. Therefore, you should try to always pay the minimum balance requires of you by your creditors. 6. Get credit assistance. If you find yourself having problems with debt, you’re not alone. You can often receive credit counseling from a variety of sources. They can teach your good financial management techniques to keep your accounts stable. Simply put, you shouldn’t live beyond your means, and avoid running up debt to unmanageable levels. Keep in mind that some changes, such as when you get a new credit card, might cause your credit score to fluctuate. However, these fluctuations usually are temporary. 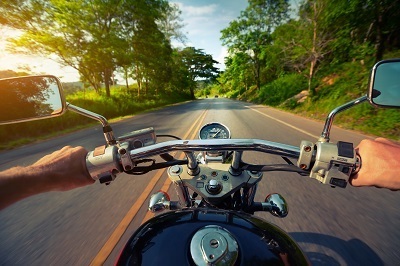 The good thing is your motorcycle insurer likely won’t use your credit score as the only factor to determine your rates. Your driving history, and the bike’s value might favorably impact your premiums. Therefore, talk to your Atlanta motorcycle insurer about the best ways to get the most affordable rates. Even if your credit score is on the low end, you might not unduly suffer consequences.